Are you ready to hear the sweetest story in videogaming? A man named Jeff Tunnell made The Incredible Machine in the early ‘90s, and seduced the world with its simple puzzles, solved exclusively with needlessly complex mechanisms. Fast forward two decades, and Contraption Maker has just been released. Rather than the contemporary rip-off it appears to be, it’s actually designed by Tunnell’s son, Jon. Contraption Maker is a true second-generation game. 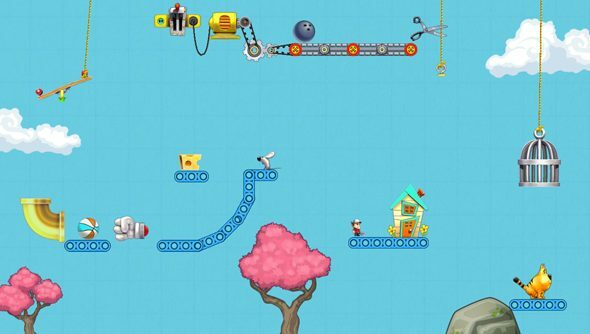 The ludicrious devices Contraption Maker has players build are known in the trade as Rube Goldberg machines, named after the American cartoonist and engineer. Given a sandbox full of physics objects, you’re tasked with performing simple tasks using a variety of objects built to push, pull or otherwise propel you towards your goal. The more ridiculous the process, the better. Contraption Maker left Steam Early Access yesterday, and costs £10.99 for two copies. A modern physics engine will have worked wonders on The Incredible Machine, don’t you think? Thanks to PCGamesN friend Paul Dean for this one.